There is no doubt whatsoever that the first earliest Jews were Turkic Mongolians with their slaves from conquered Middle East, northern India, and Eastern Europe. The Turkic Mongolians were the first people to use horses and their wide campaigns of raids began since 1800 BC. But some Turkic Mongolians were not called Jews until Turkic Mongolians colonized Assyria and Iran and turned them to Neo-Babylonia and Persia (in 626 BC and 550 BC respectively) and sent them to replace the Hebrew Israelite in 530 BC. The Israelite were originally an Arab Yemeni tribe and turned to Hebrew after they colonized Canaan since 1406 BC. They were earlier collaborators with Turkic Mongolians during their occupation of northern Kemt (ancient Egypt) as Hyksos (Heka-chasu “of YHWH”) during 1630 BC to 1523 BC. Before and during the Hyksos period the Yemeni Israelite took refuge in Abyssinia from 1876 BC to 1446 BC. 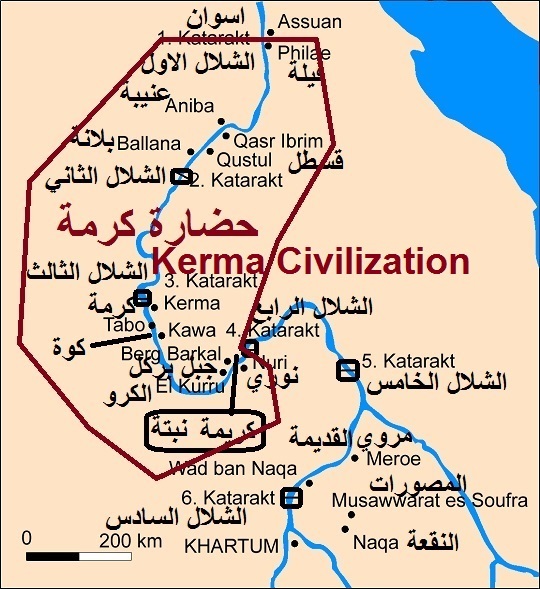 Some Israelite, including Moses, infiltrated into Kerma, in Sudan, (ancient Nubia) and carried out wide scale looting, slavery, and raids that led to the fall of Kerma civilization during the Classic Kerma period (1750–1580 BC) of C-Group Phase IIb–III. During the period from 1650 BC to 1520 BC ancient Egypt was threatened and squeezed from both the north and the south by the Turkic Mongolian Hyksos and the Arab Israelite respectively. 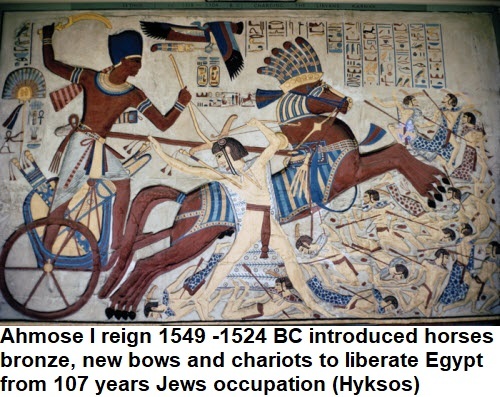 Then came Ahmose I, king of ancient Egypt (reigned c. 1549–1524 BC) and founder of the 18th dynasty, who introduced the use of horses and other military techniques which were successful for the expulsion of the Hyksos (Asiatic rulers of Egypt), assisting and securing Canaanite rulers, and liberating Kerma from Israelite in the south. Few years later, an Abyssinian king decided to expel the Israelite from Abyssinia without allowing them to carry their illegitimate wealth made during their 430 years of refuge. But the Israelite refused and escaped stealthily back to Yemen in 1446 BC under the leadership of Moses. This is the true story of the Exodus which was from Abyssinia and not from Egypt at all. Soon after receiving the Ten Commandants and the Torah in a mountain in Yemen, not Sinai of Egypt, which were in the Ge’ez language, Moses died and the Israelite rejected the scriptures and the Promised Land of Asir region (in Yemen and Saudi Arabia) and forged the Torah to legitimize the colonization of Canaan. The Turkic Mongolians who were called Jews since 530 BC carried out massive campaigns of displacements and replacements soon after they colonized Canaan. They expelled all the twelve tribes of Hebrew Israelite and all Canaanite and claimed that 10 Israelite tribes disappeared and stole the identity of two Israelite tribes. In exchange for the expelled Hebrew Israelite and Canaanite, the Turkic Mongolians (the Jews) brought slaves from Crete and Mediterranean regions and kept them first in the area of Philistia and were called the Philistines then were distributed to other regions to work as labors. Contrary to the earliest Jews, the modern Jews are a wide mixture of Turkic Mongolians with various enslaved groups and vassals from Europe and large range of associates. The migrations of Jews from Canaan first targeted both the eastern and western territories of the newly founded Roman Empire (27 BC – 395 AD) and they played very crucial roles in their businesses. So modern Jews are not a nation nor they are Semite, the same as the first earliest Jews. 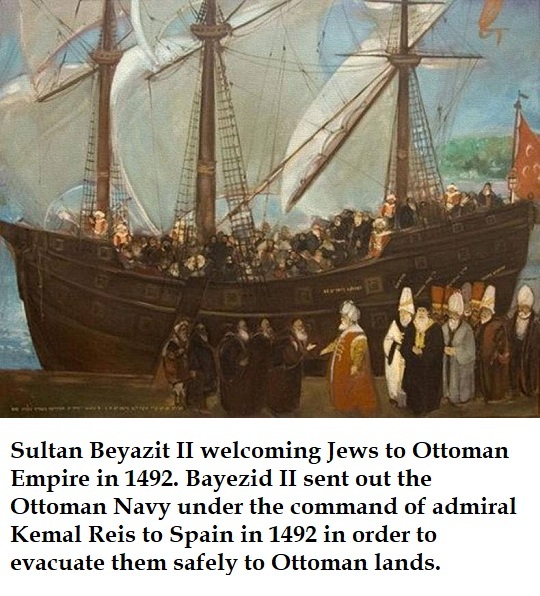 The final form of Jews started with the formation of the Turkic coalition between the Turkic Ottomans and the expelled Jews from Iberia in 1492 AD. This coalition was instrumental in the invasion and subsequent colonization of the Americas since the expedition of Columbus in 1492. The Turkic Mongolian coalition provided European migrants and slaves and later on led the transatlantic slavery of Africans to the American plantations. Moses never went to Egypt, but after few centuries Akhenaten (Amenhotep IV) (1353–1336 BC) tried to borrow the teachings of Abraham regarding monotheism but he failed after a short period. That happened about 100 years after the death of Moses. Jewish scientist Sigmund Freud must had knew much better about many stories but he preferred to keep quiet and invent more fake tales. At early times there were no Jews in or from Yemen. 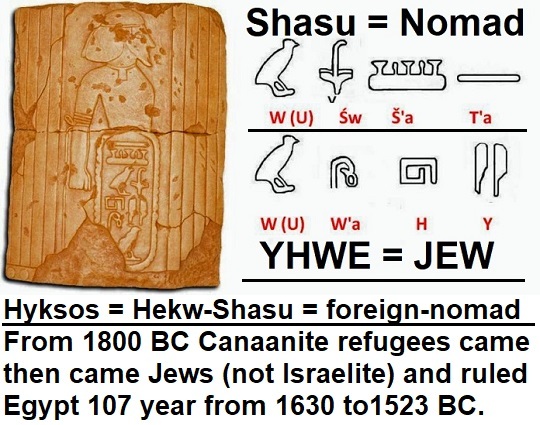 The Israelite were from Yemen but not the Jews. 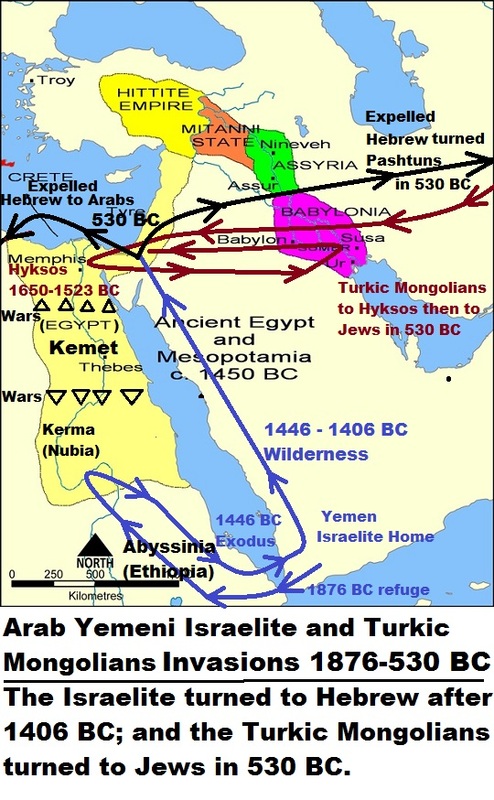 May be Jews came to Yemen later as they did to all Arabia with the Turkic Mongolian raids and expansions and during the Ottomans and similar Turkic periods. The Turkic Mongolians created what is called today the Slavic people in the Steppe, Eastern Europe, Balkan; plus took Iran, Anatolia and the Caucasus. Later on they penetrated into the Germanic and Roman tribes and formed and caused the formation of new European groups. They also created huge slavery all over the world since their expansions. 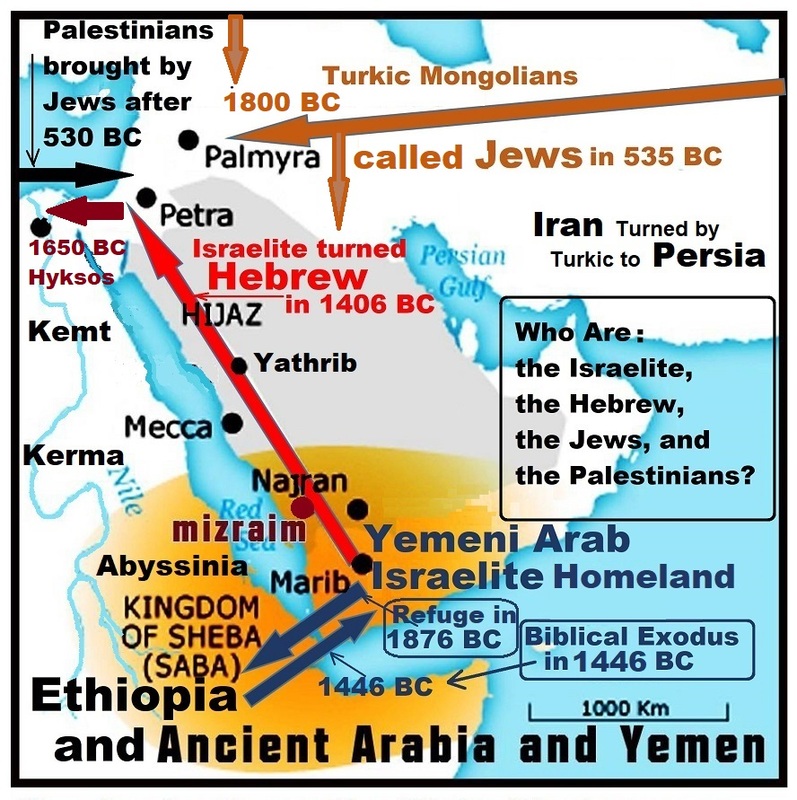 The Yemeni Arab Israelite became Hebrew in Canaan in 530 BC, then the Jews kicked them out of their colony in Canaan. Now, it is reasonable to suggest that the Pashtuns could be part of the expelled Hebrew Israelite. Watch the following video. The Abyssinian Hypothesis on Israelite, Hebrew, Jewish History. This is a brief history diagram according to the new Abyssinian Hypothesis, on the second following video. Also see: Cyclopedia of Biblical Literature Ed John Kitto Vol 1 1880, page 30. Jews claim that Abraham knew camels. If this is true then Abraham was native of Eastern Africa, if not then the story of Abraham must be different. And Jews have nothing with Abraham and the region. Arabia never knew camels at 2000 BC. It is getting more reasonable to believe that Abraham was Abyssinian just as Melchizedek, Melkisetek, or Malki Tzedek in Amharic: መልከ ጼዴቅ ‘malkī-ṣeḏeq’ the king of Salem and priest of El Elyon who blessed Abram by El Elyon. Genesis 14:19. This shall lead to conclude that Salem is indeed was a city in Abyssinia; and the whole Torah and the Bible must be re-written. The history from Abraham to Moses certainly happened but in completely different geographic settings. It could had happened in Abyssinia and ended up in Yemen. Indians and the world must know about the relationship between Pashtuns and the both the Israelite and how the Turkic Jews brought them to Afghanistan and India which led to the creation of Pakistan and the civil war in Afghanistan. “. . . finally solved” – that may depend upon further discoveries. But, you have done good research, my friend. The Jews have really screwed the rest of the world over for centuries. The fact that today Trump moves the US embassy to Jerusalem just serves to show who has the real power in the USA. Relocating the embassy and declaring Jerusalem capital are symbolic changes. They don’t change much but the issue is that both sides are illegitimate settlers, invaders and colonizers. Supporting the Palestinians or the Jews will not correct the history and the present. People must put both of the Jews and Palestinians in one boat and then try seriously to restore real truth and justice to the region and the world. Hebrew was invented around 530 BC only. 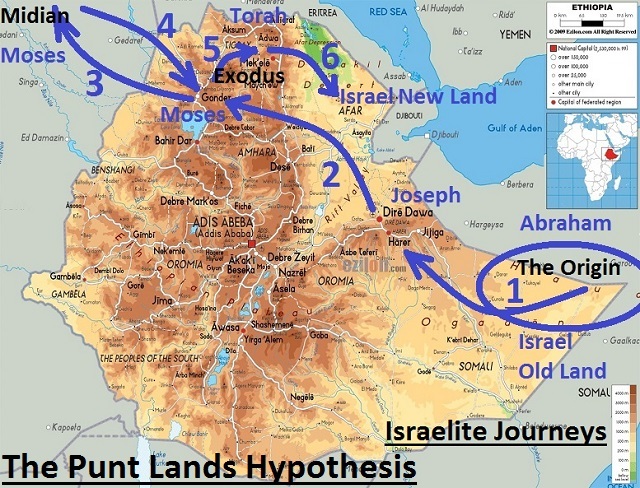 The real Israelite were from the lands of Punt (the Horn of Africa). They spoke Puntite language, most probably Ge’ez, as aq main language since Abraham in 2000 BC. Few elders from the Israelite were invited to Neo-Babylonia in 580 BC and they collaborated with Turkic Mongolian Persians to invent Jews, Judaism. and Hebrew to invade and colonize Aram. Hebrew is a mixture of Ge’ez with Persian and Aramaic languages, cultures and people. The Hebrew Israelite were the lost sheep of the House of Israel; while the Ge’ez Israelite were the original majority of African Israelite. The Ge’ez Israelite also collaborated with Hebrew Israelite and their Turkic Jews partners to raid. colonize and enslave many people and destroy nations in Africa. Those defeated and enslaved other Africans were not Israelite but only vassals. The Romans, and also the Bedouins (not Arabs) in Arabia, were also of Turkic Mongolian origin and they created slavery , Catholicism, the Vatican, and the ruling monarchies in Europe. Colonization and slavery in the Americas were Turkic Mongolian projects since Columbus.